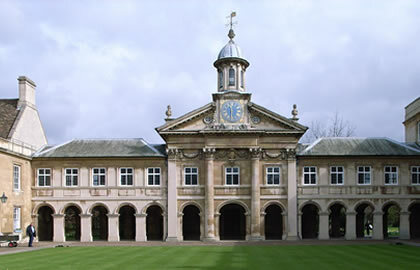 Cambridge - A beautiful university city renowned for its colleges, chapels and gardens, some dating back to the 13th C. Punt down the river, stroll around the streets or tour one of the many museums. This trip involves the passage of a short length of tidal river between Salter’s Lode and Denver Sluice so when planning your trip contact the Lock keeper at Denver Lock on 01366 382340 to ascertain the tide times for the outward and return trips. 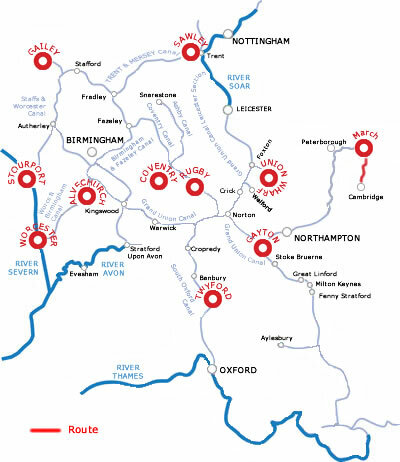 It takes about 5 hours to cruise between Salter’s Lode and our base at March so once you have all this information you will be able to plan your journey. Turning left from our marina you will shortly come to the fenland market town of March where you will find free visitor boating moorings on either side of the town bridge. Like all the ancient settlements of the Middle Level, March stands on higher ground that was once an island in the marshes so as you pass under the town bridge the High Street shops are level with the top of the bridge. St Wendreda’s church is a twenty minute walk from the town centre – well worth it according to the late Sir John Betjeman, the Poet Laureate, journalist and architectural critic, who said “It is worth cycling forty miles in a head wind to see”. Follow the cycle route to the Neale Wade College. Six miles from March is Marmont Priory Lock and above the lock you pass through the twin villages of Upwell and Outwell in what is one of the most interesting sections of the trip as the village streets line both sides of the river and we pass houses, gardens, shops, pubs and churches and several places have visitor moorings. In the springtime the river banks here are crowded with daffodils. Outwell Basin is a short stretch of water a little wider than the rest of the navigation where the route turns sharp right. There are visitor moorings here provided by the Well Creek Trust. This was once the junction between the Old River Nene, Well Creek and the Wisbech Canal, which was closed in 1926. The Wisbech and Upwell Tramway opened to Outwell in 1883, was extended to Upwell in 1884 and closed in 1966. The Reverend Wilbert Awdry, author of the ’Thomas the Tank Engine’ books, lived in the area and wrote ’Toby the Tram Engine’ based on this line. Two miles further along Well Creek we cross the Middle Level Main Drain, the waters of which are pumped out to sea by an array of large pumps. After this you cruise through open countryside and the village of Nordelph before arriving at Salter’s Lode Lock. After you have transversed the tidal reach to Denver you are on the Ely section of the Great Ouse. At Denver there are moorings near the Jenyns Arms pub and in the village is Denver Windmill. Also from here, if you have time to spare, you can go through the new lock into the Relief Channel to visit Downham Market where visitor moorings are provided. Less than a mile on from Denver is the junction with the River Wissey, which is navigable for 10 miles up to Stoke Ferry, one of the four navigable tributaries of the Great Ouse. You pass two more of these (The Little Ouse or Brandon River, navigable for 13 miles to Brandon Lock and the River Lark navigable for 10 miles to Judes Ferry) as well as the village of Littleport before arriving at Ely. Ely has a pleasant and busy waterfront with the city centre a short walk away up a steep hill. As well as the magnificent Cathedral there is a fascinating museum to be found at Oliver Cromwell’s House, the Ely Museum at the Old Gaol, and a Stained Glass Museum at the cathedral. In addition there is an Antiques Centre close to the river and many shops in the city centre. Four and a half miles upstream from Ely we arrive at Popes Corner where the Great Ouse turns right to Bedford and straight ahead is the River Cam leading 14 more miles into Cambridge. The name of the Fish & Duck pub here reminds us of the original harvest of the fens before they were drained 400 years ago. It is over six miles to the electrified, boater operated, Botisham Lock and on the way we pass the entrance to the short Burwell and Reach lodes at Upware Junction and then Swaffham and Bottisham Lodes. Above the lock we go by the Cam Sailing Club before arriving at Clayhithe Bridge where there are visitor moorings. Two miles from Clayhithe we come to Bates Bite Lock, another boater operated electric lock, then go under the A14 road bridge and past the village of Fen Ditton. Around this point the usual rule of the river is reversed for the convenience of rowers so look out for the ’Keep Left’ notices that mark this section. Once past this it is only two miles to the head of navigation for powered craft at Jesus Green Lock. If you want to go punting above the lock Scudamore’s offer a wide range of tour and self-hire punting options. Contact them on 01223 359 750 or via their website at www.scudamores.com and for more information on Cambridge see www.visitcambridge.org or telephone 0871 226 8006.